As I settle into the passenger seat of the taxi and reach for the seatbelt, I find none there. “No problem” says the driver as he accelerates down the road, deftly weaving in and out of slower moving traffic. So, the stories I’ve read about Romanian drivers are not exaggerated, it turns out. The ride from the Bucharest airport to Gara de Nord, the main train station in town, does not impress me. The train station itself is equally unimpressive. As we pull up to the entrance, I find myself looking around for the actual station. 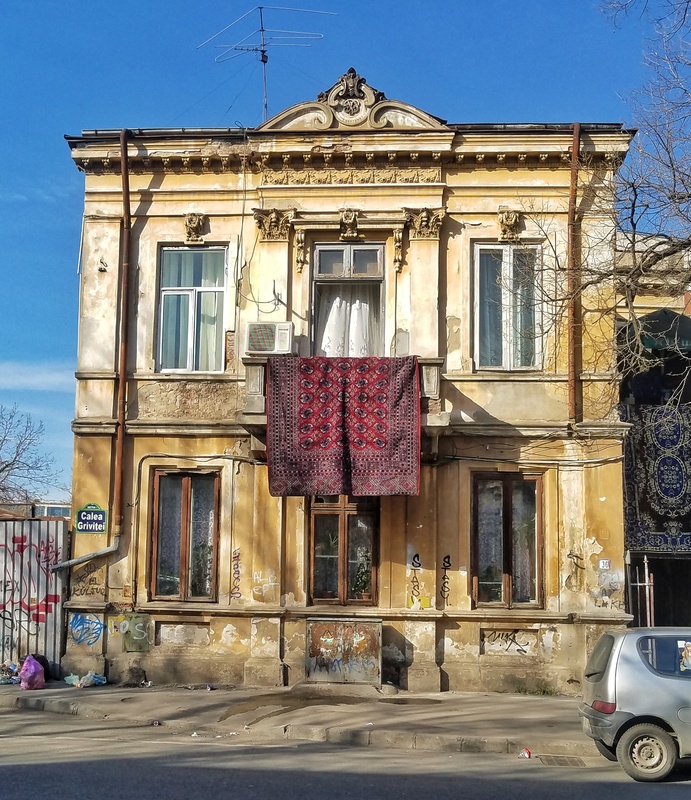 There is no grand looking edifice you might find in other European capitals, but instead I find a squat, nondescript building. Inside are rows of kiosks hawking cheap knockoff wares at ridiculously low prices. 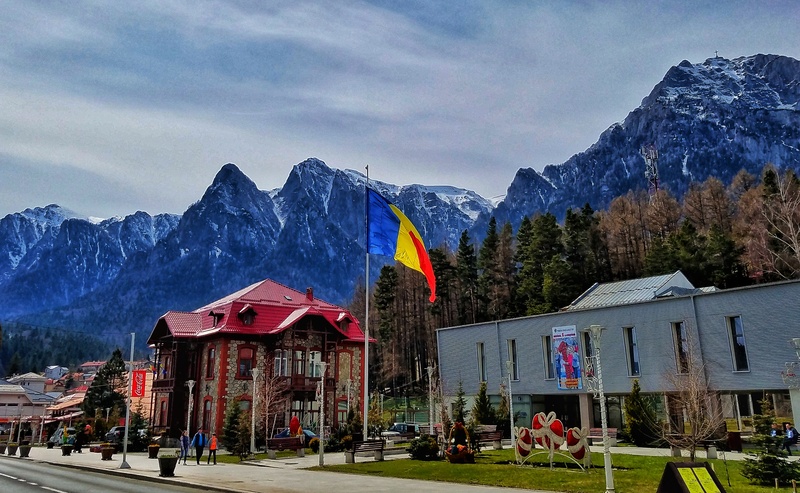 I am not here to stay in Bucharest, though I will be coming back at the end of my journey to spend a day exploring the city. Instead, I have come to the train station to take the 2 hour journey into Transylvania. 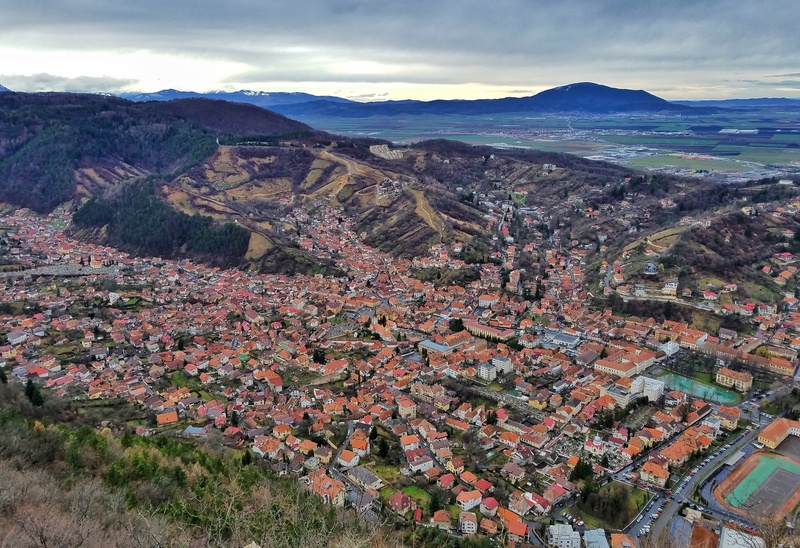 My final destination is Brasov, which I will be using as my home base for my week here in the country. 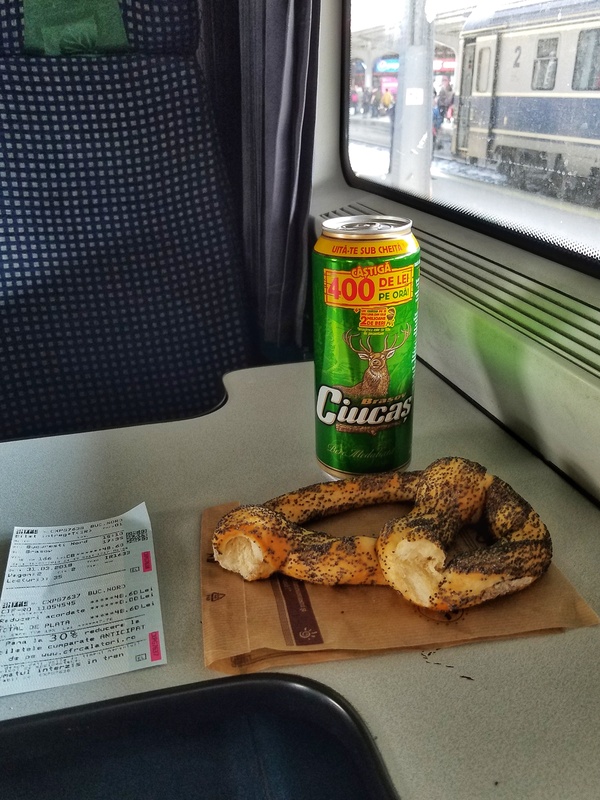 I settle into my seat on the rickety, slow moving train after grabbing a tall boy and covrigi (a Romanian pretzel) and enjoy the passing scenery. En route to Brasov, the rolling foothills suddenly and without warning transition into towering, rocky peaks. 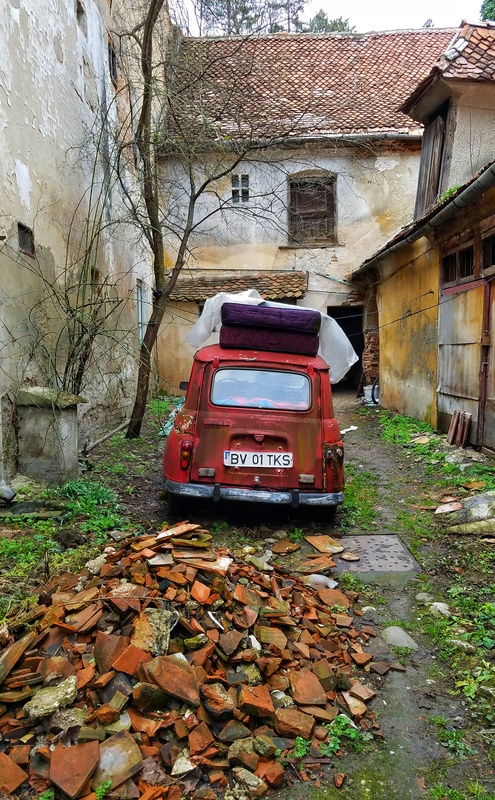 After emerging from the train station on arrival in Brasov, I hop in the first taxi I encounter. 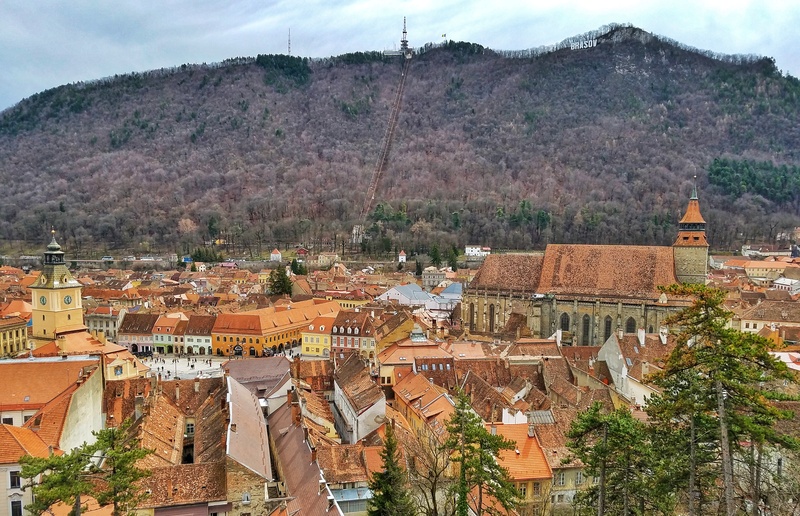 “Look, look: Hollywood!” the taxi driver exclaims as we drive toward my hotel, pointing to the huge, white BRASOV sign that sits on the mountainside overlooking the town. It bears more than a striking resemblance to the renowned Hollywood sign. He’s friendly enough, but is insistent on taking me on a tour the following day of what he deems to be the best castles in Romania. “Maybe”, I say – knowing full well that I have already meticulously planned out my daily outings. “You take my phone number. Call me tonight, yes?” I pretend to put the number into my phone. “Call me now so I make sure you have the right number”. I get dropped off at my hotel and I immediately leave my bags and head out to explore the town. 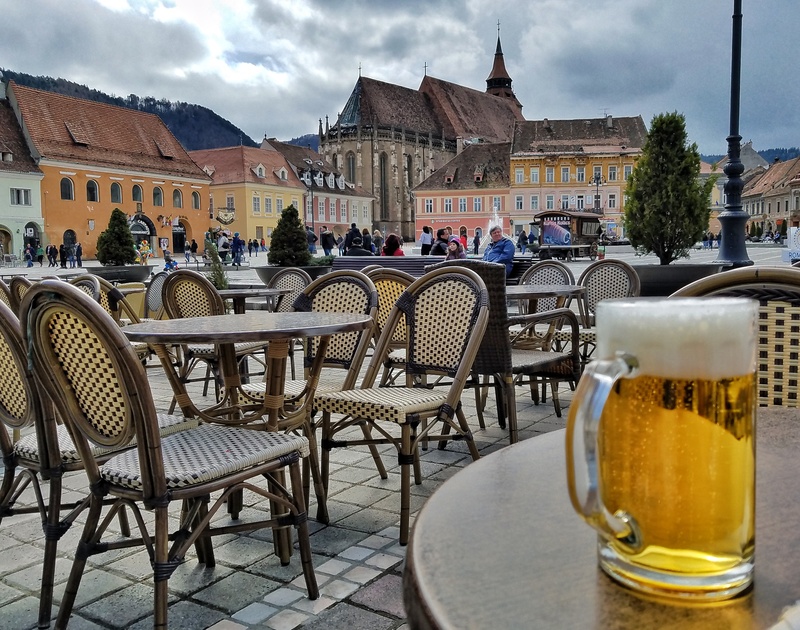 It’s approaching evening, and so my first day mostly consists of wandering around the main square called Piata Sfatului and popping into a couple of pubs along the way. I’m surprised at how crowded it is. It’s almost Prague at Christmas Eve crowded. 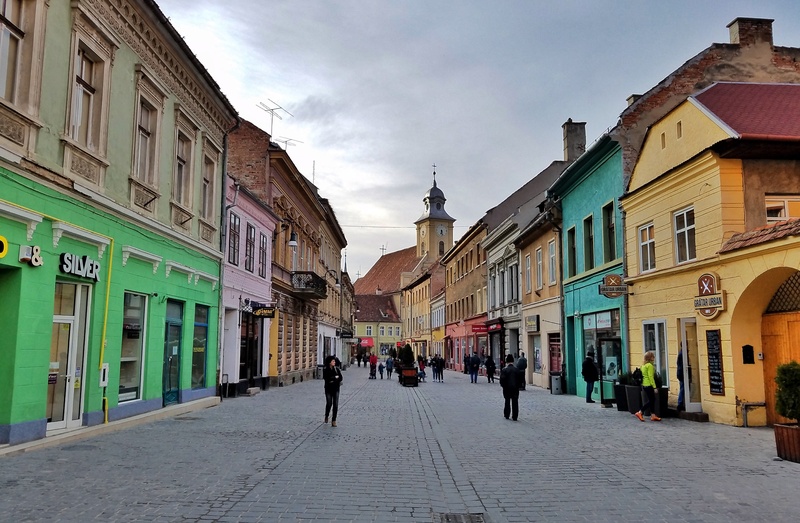 Surprising, considering Brasov is not a name you often hear bandied around with cities like Budapest or Dubrovnik or Munich. I will later discover that it is almost completely empty outside of the weekend. The following morning I arise early. After a carb heavy hotel breakfast, I immediately hit the hiking trails. 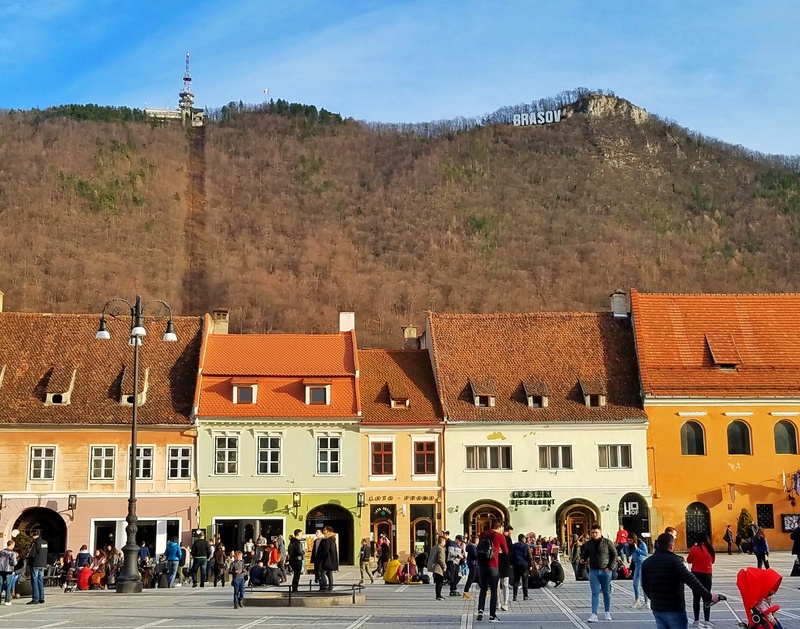 The path to the top of Tampa is all switchbacks making their way up through the dense forest that covers the side of the mountain all the way to the top, eventually leading directly to the big BRASOV Hollywood sign. The walk up is peaceful. Hardly another soul to be found, save for the elderly gentleman quietly and slowly making his way up, hands folded behind his back. It’s the tail end of winter, and the brisk morning air is refreshing; a good antidote to the steep trails that take me higher up the mountain. In the distance I see a hint of dark clouds. Too far away to be worrisome, I think. Within minutes, I feel a drop on my arm, followed by a few more stray ones. No biggie, I think, it actually feels kind of nice, having worked up a bit of a sweat. The rain slowly and steadily increases in intensity, until I finally make it to my destination. 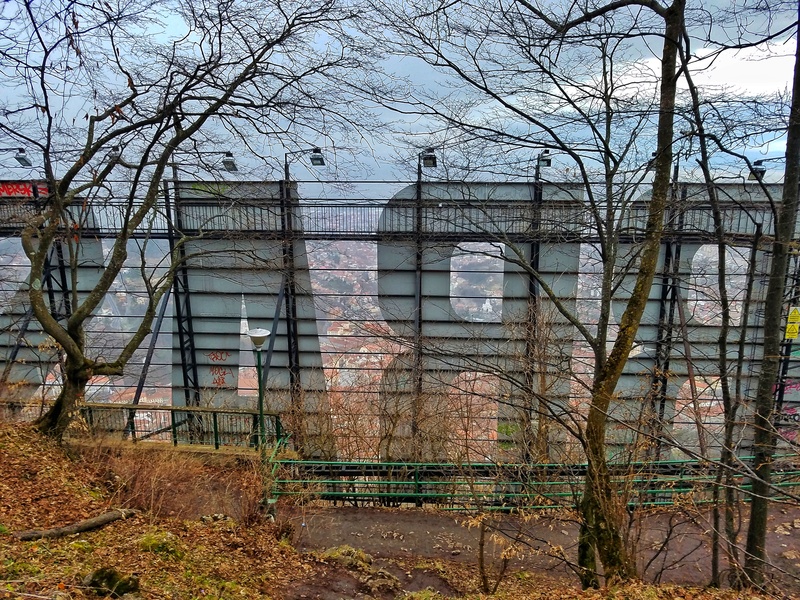 Before me lies the hulking BRASOV sign. The wind howls. The rain is completely horizontal. I shelter behind a rock, drenched from head to toe. I briefly emerge from my shelter to try and get a quick photo of the vista that lies below me, but it’s mostly enshrouded in sheets of rain. It’s only later I’ll return to the spot once the rain has passed to grab a more clear shot. In the meantime, I scramble down slick, muddy pathways to a mountaintop cafe, where I warm myself with copious amounts of hot coffee and futilely try and dry myself off with cheap napkins. The differences in the view pre and post rain are notable. As I look out over the sprawling city below from my perch on Tampa mountain, I spot a large gray area on the outskirts of the town. After much squinting and trying to determine what I’m looking at, I decide that I’ll make my way in it’s general direction to see what it is. It appears to be a cemetery of some kind, but it seems much too large to actually be one. I begin my descent down the mountain in its general direction. On the walk toward the mystery spot, I am surprised at every turn by this town. I don’t know exactly where I’m going, but I do have a general direction in which I know I need to walk. Along the way, I find charm down every alley I pass. I wander through the attractive Schei district, an area that is a bit overlooked by most visitors. 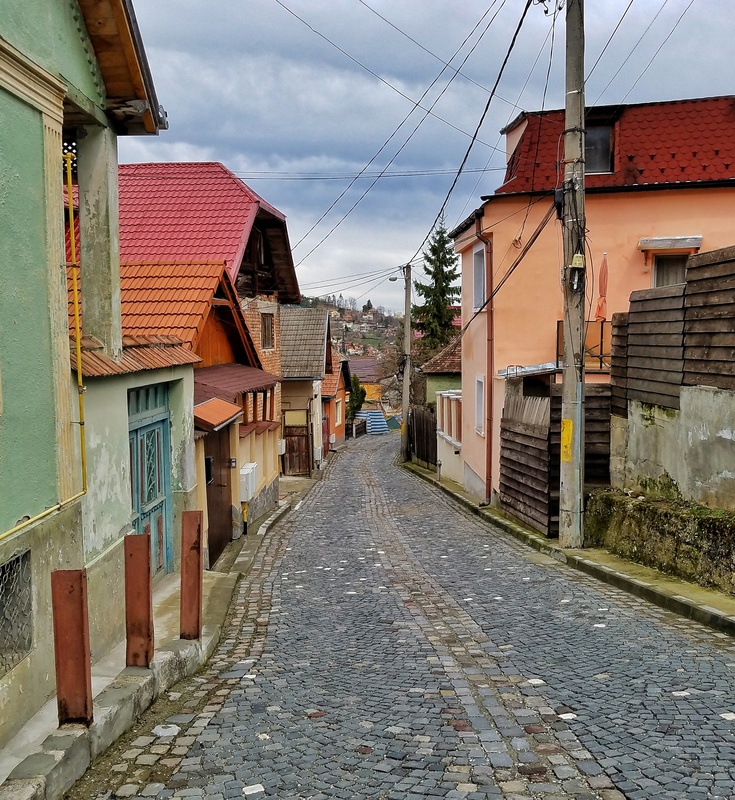 Here I move through cobblestoned residential streets before walking by the Saint Nicolae church, with more than a passing resemblance to that well known Disney castle. 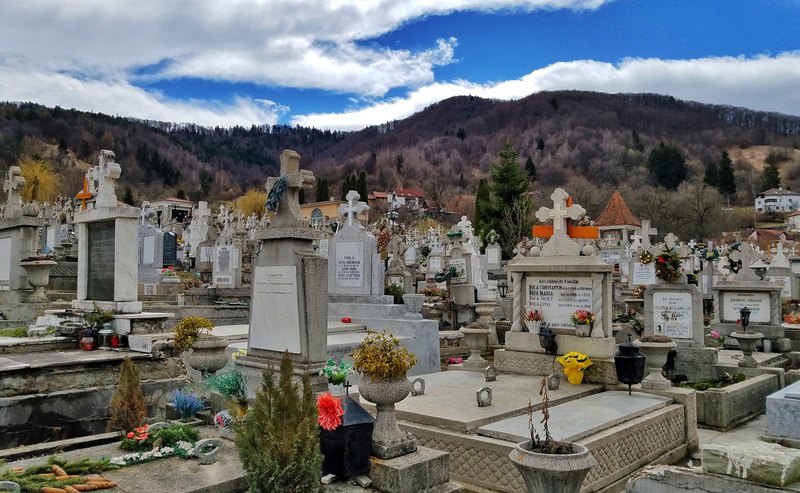 I eventually arrive at my intended destination, which turns out to be the largest cemetery I’ve ever seen. I spend some time quietly wandering up and down the rows, reading inscriptions on countless headstones. 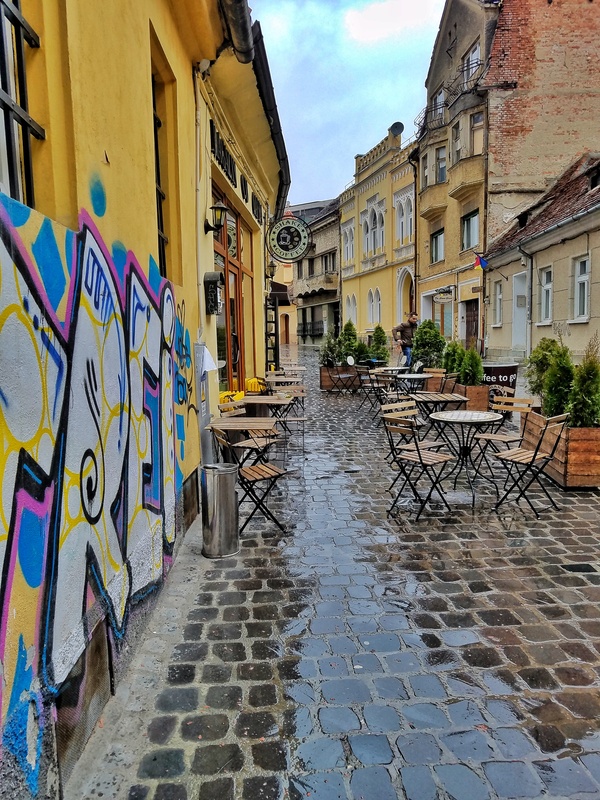 The rest of my days in Brasov are spent wandering the city without much agenda. It’s not really necessary to have one here. There are things to see and do around every corner. I find that by just setting off down an unfamiliar street provides some new and interesting sights to see. A nice cafe or drinking establishment catches my eye every once in a while. There I pass the hours reflecting on my experiences and catching up on my writing. 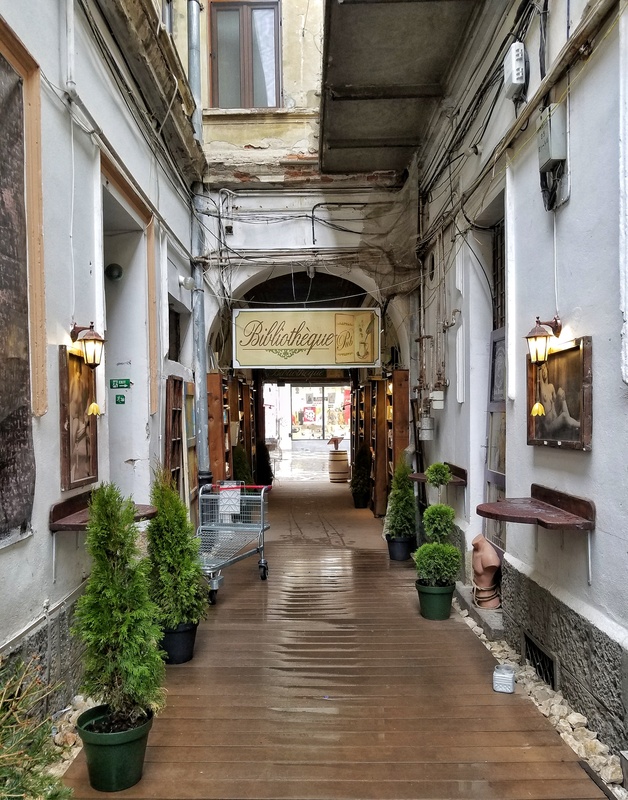 One highlight is the book-themed Bibliotheque pub, just off Strada Republicii, the main drag that connects to the old town square. In the evenings, I retire back to my hotel perched on a hill above the city and enjoy the sights and sounds of the city from my open window, the pleasant breezes filling my room with refreshingly cool air. As I continue my exploration of the city, I find a few notable spots. 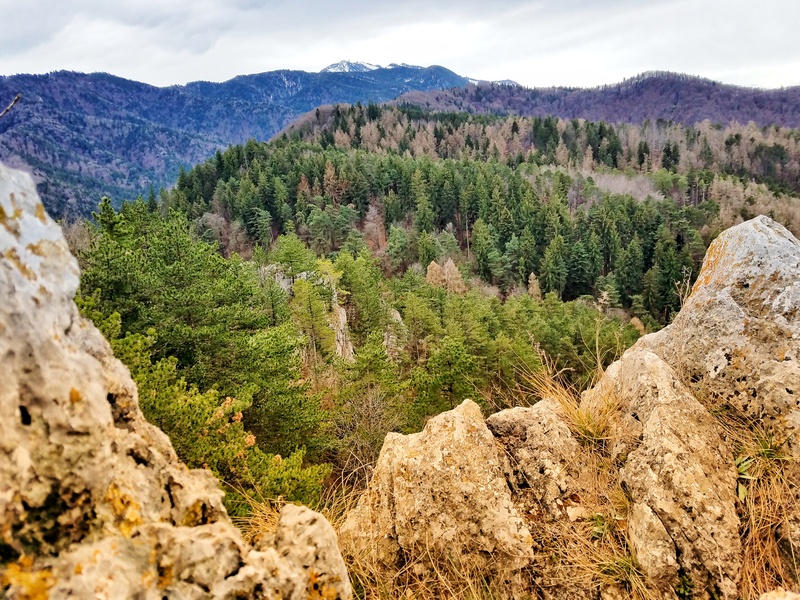 Opposite Tampa Mountain sits Turnul Alb and Turnul Negru, also known as the white and black towers. 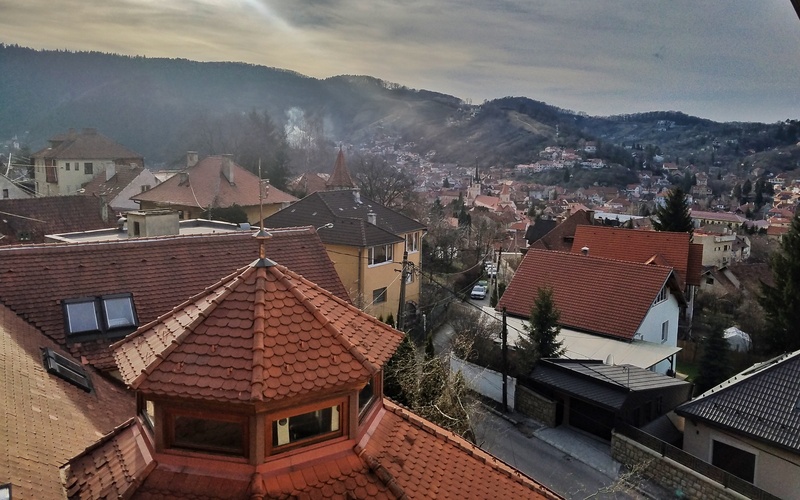 After an easy climb I’m treated with a perfect vantage point for gazing out over the charming tiled roofs of the old town. From here, the hulking “Black Church” dominates the view, with its stone walls and pointed spire rising high above all other structures in town. 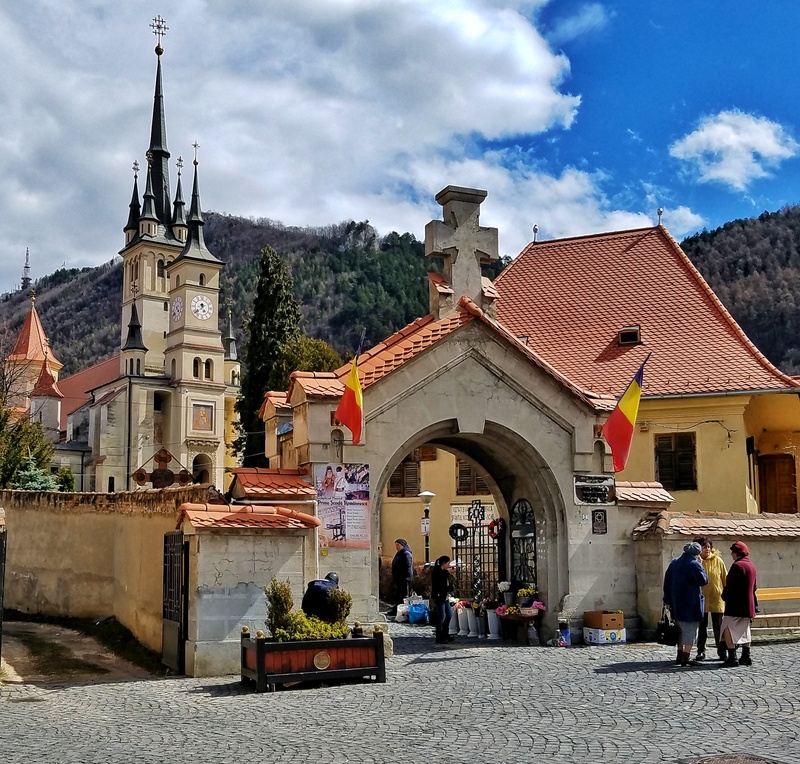 In my research for the trip, Brasov was often cited as a good home base for any Transylvanian visit – centrally located for easy day trips, yet charming enough in its own right to keep you occupied for a few days. 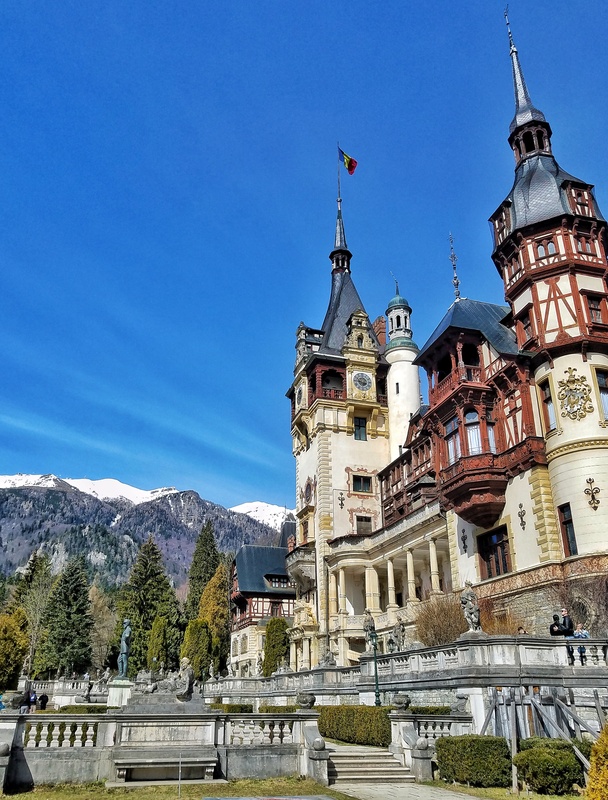 On my final day in town, I take the train south to nearby Sinaia, a mountain resort town, most famed for its impressive castle called Peles. 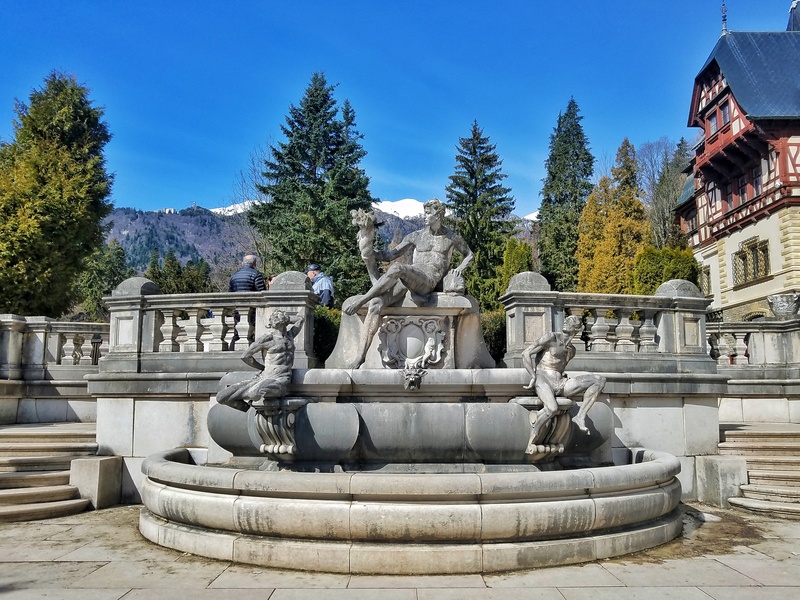 The town is nestled high in the Carpathian mountains and is filled with numerous four and five star hotels, nice cafés, and fine dining establishments. After arriving at the train station, just a 40 minute journey from Brasov, I make the short walk to the castle. I find waiting taxi drivers just outside the doors to the station, eager to take me to the castle for a cheap price. 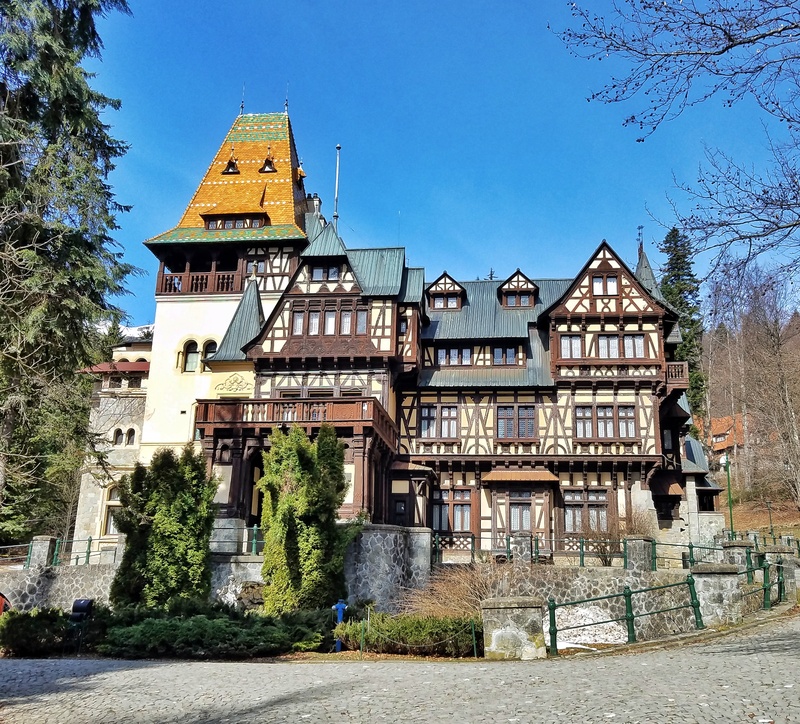 Preferring the exercise, however, I decline and make the thirty-ish minute walk (mostly uphill) to Peles Castle. 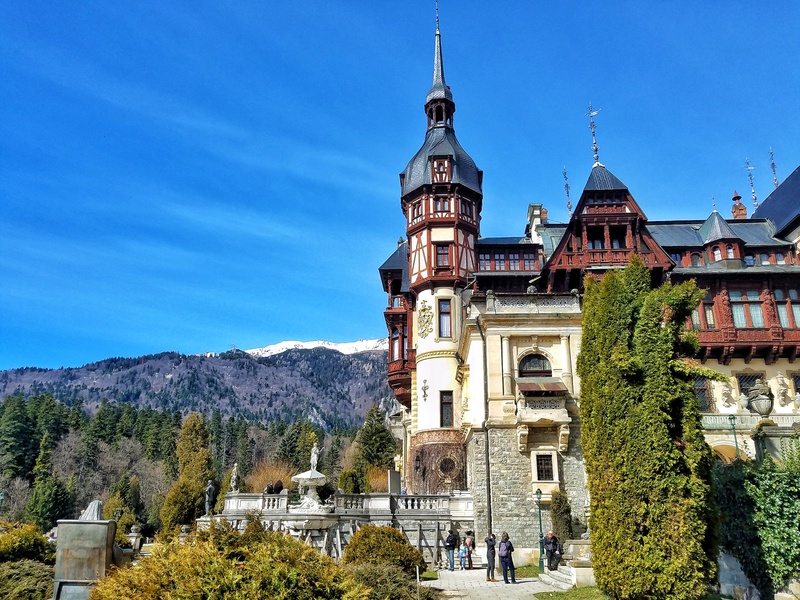 Though the castle isn’t open for visitors today, I enjoy my time wandering the castle grounds and taking in the sights, the towering mountains providing a rocky, snow-capped frame to this ornate structure. Just next door to Peles I find the smaller Pelisor castle, which was actually used as the residence quarters of the family that constructed the castle complex. 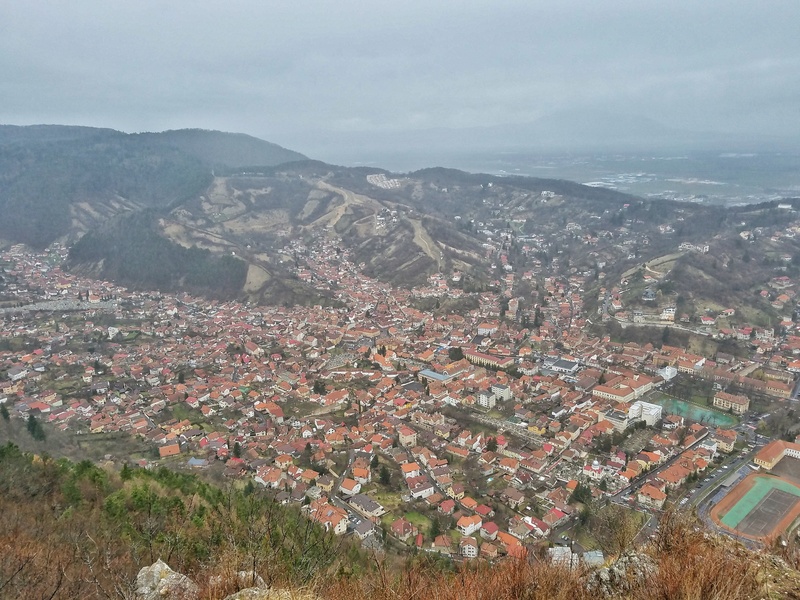 I poke around for an hour or so before grabbing a cheap taxi ride to the neighboring town of Busteni. Though the peaks that define the skyline here are far more impressive than its sister city, the town itself is decidedly more rough and tumble. The main attraction here is the cable car that lifts you to the top of the highest peak in town. As I walk from the station through the town, I don’t get the best vibes. Though the scenery is almost surreal in its beauty, the infrastructure of the town is lacking. The metal platforms designed for safely taking you across the busy highway are severely rusted. I worry that it will collapse under my insignificant weight, sending me plummeting 20 meters into the traffic passing below. A bit further down the street, a man staggering down the sidewalk catches my eye and decides he would like nothing more than to fight me. I avoid eye contact and increase my pace as he yells in incomprehensible Romanian behind me. 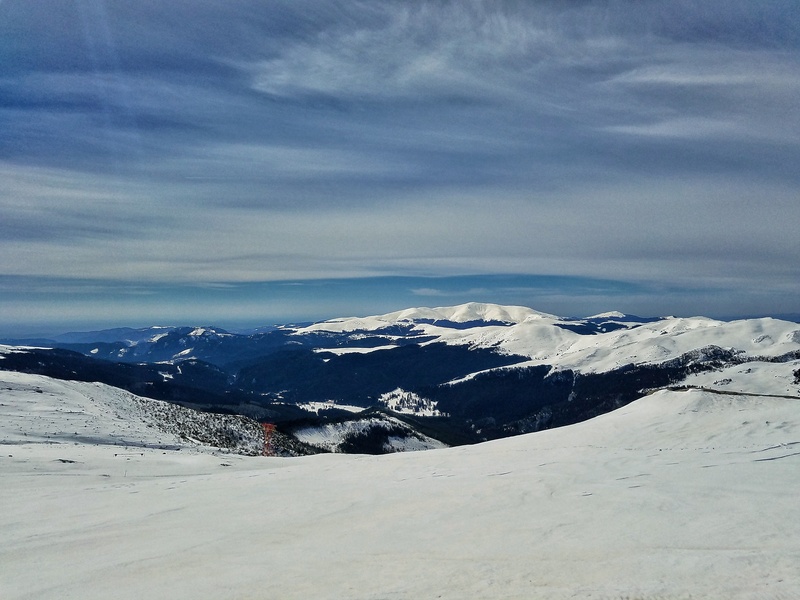 The ride up to the mountaintop is a stunning 15 minute journey, ending in the still snow covered plateau at the top of the peak. The air is thin and I find myself stopping frequently to eat snow and catch my breath as I venture away from the cable car station. Though I’m not ready to leave Transylvania, I reluctantly take the train the following morning bound for Bucharest. Based on my initial impressions from arrival, I’m not necessarily looking forward to going back, but as I will soon find out, my first impressions of the capitol city were incredibly wrong.